I'm J.Caroline and this is where I write about my family, my creative projects and anything that catches my attention. Search my soul. Er, my blog. Happy Birthday Sophia (and me)! I just got back from Quilt Market in Minneapolis, but I haven't unpacked or downloaded my pictures yet, so that will have to wait. In the meantime, Contemporary Cloth is sponsoring a giveaway. Two yards of Cloud9 Organic Fabric-- you mix and match in half yard pieces out of either collection, Under the Sea or Happy Garden. Contemporary Cloth offers organic printed lines such as Cloud9 and Mod Green Pod. They also carry a wide range of designer quilting weight and home decorator weight textiles. And they are offering a 20% off coupon through June 1, using coupon code "jcaroline". Okay, for the giveaway part. To enter, leave a comment here by June 1 (Tuesday) at noon. Tell me if your plans for sewing this summer are: 1) I've got big plans for summer sewing, 2) I swear I'll sew every summer and I never do, or 3) Summer is coming? I'm getting married in July and my big summer sewing plans are to start on my first quilt! I have tons of plans, and I'll probably only get half of them done ... but tops is a new dress and roman blinds for my son's room. I've definitely got plans to sew this summer. My daughter will be going to summer school, walking distance from our house! Whew hew, no more 20 minute drive both directions to get her to preschool. I can't wait to sew, sew, sew this summer. Summer? It's always summer in Hawaii! But I sew year round, so it's not a factor! The summer months this yr-maybe get a start on Christmas gifts. I always say I'm going to do that, but maybe this year I actually will! I'm a combo of 1 and 2 - I have big plans but never end up getting them done. This year I vow to live up to at least a few of those plans! I love these fabrics - so adorable, and organic to boot! 1) I've got (sort of) big plans for summer sewing. I plan on sewing a lot this summer. As soon as I get the veggie and flowers in, oh and as soon as I finish teaching my son to drive, and visit my parents, and .... I do have a few things cut out, hope that counts! I swear I'll sew every Summer/Fall and NEVER DO. Though, I usually manage to make at least one quilt every 18 months or so, so maybe I shouldn't say NEVER. Maybe it's more like, I have big plans and then I get sidetracked and they get pushed off. A little. Or something. I love LOVE that sandpiper fabric. I have a baby coming who needs new crib sheets and I sort of feel like that pattern might be a MUST HAVE for his snoozing pleasure. I have BIG plans for sewing this summer! Expecting a baby in September & have so much I want to make...swaddles, blankies, burp cloths, tiny dresses (if its a girl)....the list goes on & on! I'm #3 all the way. I have a bunch of quilts in various states of finishing, and maybe i'll actually make something for *myself* for a change. My goal is sew big! Picked up a stash of summer top patterns for my daughter that I want to do and make lounge pants for both my kids. I have big plans for sewing this summer and I'm already underway. Thanks for the chance to win. Amy Karol, author of Bend the Rules Sewing, covers food, family and sewing. She has a very appealing retro style to her work. Holly Becker writes a gr8 (hee hee) decorating blog that often covers fabric as well. 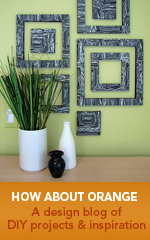 Grace has an excellent blog covering home decor and great design. I'm currently obsessed with her "Before & Afters" on Thursdays. She has great DIY projects on Wednesdays. Of course I think it's the best source for everything creative! Lizzy House's blog, designer of Lizzy Dish. Patty Young's blog, designer of Andalucia Fabric and Ribbon. Paula Prass' blog, designer of Flights of Fancy. Kim covers all things fabric- its composition, vintage prints, new prints, where to buy it, digital printing of, etc. etc. Melissa Averinos' blog, designer of Sugar Snaps fabric.